I can't quite get my head round the fact that we're edging closer to the Great British Bake Off finals already. Baking one recipe a week is a challenge enough, let alone having to do 3 like the contestants do. There's no way I'd ever cope on the show. Most of the last week has been spent deliberating what to bake for Victorian week. I don't like game, fondant icing and fiddly decorations leaving very little leeway for Mary and Paul's challenges. Hopefully no one will mind that I decided to make my own game-free hand raised pie. Its got pastry and meat so I should be ok, right? My Grandad absolutely loves sausage meat pies so this, Gala pie was for him. Packed with pork mince, sausage meat, bacon and scattered with quails eggs. For the filling I used the Hairy Bikers' recipe, adding far more sausage and bacon to fill a generous 2lb loaf tin. To ensure I was making Paul-approved pastry, I used his own recipe, here. The pie itself was so dense it didn't quite cook all the way through, particularly the thick crust. To rescue it, it'll be wrapped in individual foil servings and warmed in the oven as it wasn't made to be eaten the same day. I should have taken it out the loaf tin half way through the bake to get some colour. I was chuffed at how well the quails eggs cooked though, well worth how fiddly they were to peel. hot water crust pastry is relatively simple to make. Rather than hours of cooling and folding the key is to make a rough dough and to work into shape whilst still warm. If it starts to cool it will crumble so can be warmed again if needed over a pan of simmering water. 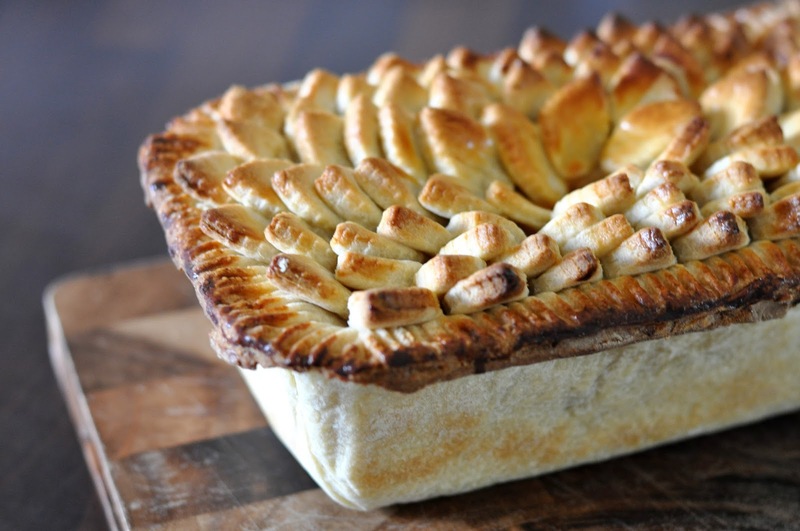 supposedly you can also make hand-raised pies with the same pastry, where you don't use a tin or mould. When warm its quite slithery, so I wouldn't. Why else are there intricately detailed pie tins? 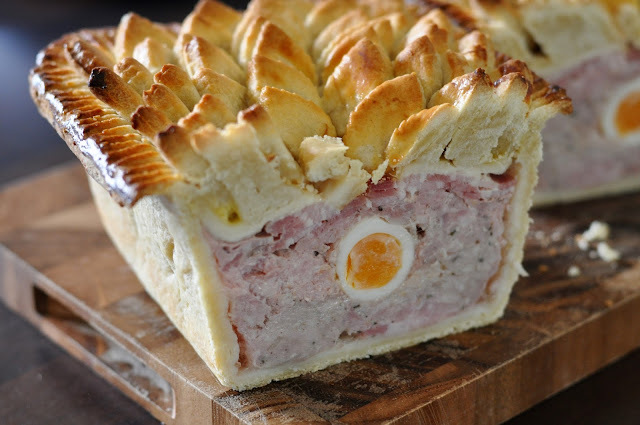 as this type of pastry is quite fatty its good at holding juicy fillings making it ideal for pies. If you're particularly worried about a juicy filling or gravy in your pie, then brush the pastry with egg yolk before filling. The protein in the egg yolk will form a barrier against moisture. this type of pastry doesn't need to be blind baked so ensure to use a tin that conducts heat effectively, i.e. something glass or black metal. I used a light coloured loaf tin which doesn't seem to hold heat too well. another way of avoiding a soggy bottom is to place the tin on a pre-heated pizza stone or heavy baking tray so allow extra heat into your pastry quicker. The trick is to get the pastry to crisp up quickly before the filling cooks. another lesson I've learnt is to allow some space between the filling and pastry lid to allow steam to escape which will help it to cook throughout. Use a pie funnel, cut slits on the top and don't pack any gaps full of bacon (like I did).